Have you ever thought about having your own domain name for your vacation rental? Well, if you haven't you really should as it is a great way to market your business. The latest addition toivacationonlineis having the ability to purchase your own domain name and directing it to your listing. This helps you make your business a more personal transaction between the guest and yourself. With that in mind we decided to developivoldomains.com.This allows you purchase your own uniqe domain name and direct it to your listing onivacationonline.This will really help you when speaking potential guest through the phone or email. Here is a great example of what I am talking about. The owner of unit 497 "Blue Tides" on ivacationonline bought the domain namehttp://bluetides411.com/.He has this domain name pointed to his listing, so it looks like he has a privated web page. You can also have your domain masked, so if a guest navigates to another section of the site the url http://bluetides411.com/ is still showing. With all the tools and features available onivacationonline,you have no reason to send your guest anywhere else. Several of the owners who use theonline vacation rental softwarewe developed are shutting down their web-sites they have had for years. They are then using the domains they have and pointing them directly to their listing. So, lets say you receive a phone call or email from a prospect, you can respond to them by saying "go to my site http://bluetides411.com/." Once you are there you can see a slide show of recent pictures, my guest book, google map, calendar and book it online. This allows the guests to go straight to your property without having to navigate to get there. The less work the prospect has to do the happier they are, which usually intices them to book your unit. It only makes sense to send them to a site where they can actually book the unit. If you are still running a regular website for your rental/rentals, you may want to consider shutting it down. This will save you monthly hosting fees and you can direct your url to your listing onivacationonline.Not only will these save you money annually, it will most likely increase amount of bookings each year, with less work involved. The less navigation or clicks a prospect has to make the better it is for your business. Lets say you currently do not have a domain, you can easily create one ativoldomains.comfor $8.99 per domain. Simply go to the website search for a domain that you would like to have and purchase it. Here are some tips to finding the right domain name. First, it is best to keep it short as possible, yet relevant to your rental. Find one that is easy to say for when you are talking to prospects on the phone, so there is no confusion. Ok, so know you have your domain name. The next step you want to do is add "domain forwarding" (this is a free feature). You will copy and past the url of your listing onivacationonlineinto the domain forwarding section. By doing this when somebody types in your domain name it will forward them to your vacation rental listing. We also suggest that you use the masking feature. What this does is, when a prospect types in your domain name it will stay there, so they don't even know they are onivacationonline. Would you like to have a way to track the traffic coming to your listing. Where it is coming from, which region or state, what day, how much per day, etc..? You can easily do that for free through Google Analytics. This great service will tell you what search terms prosprects used to find your site. The information Google Analytics provides is endless. Utilizing private domains and google analytics is a powerful combination to running a successful vacation rental business. To get google analytics, simply sign up for a free account. Once your accout is up, you will enter the domain name that you want tracked. 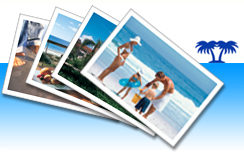 Google will provide you with a html code to enter on the description of yourivacationonlinelisting. You will need to use the SOURCE button on your description to enter the html code. The code that you enter will not be visible to you or anyone else, however google will pick it up to track the statistics of your traffic. To have your own domain for your listing only cost $8.99 and everything else mentioned is absolutely free. We have set this service up to as reasonable as possible for you. Give it a shot, I feel you will find it a great addition to your business and make it more personal. Let us know if we can help you in anyway, that is what we are here for!